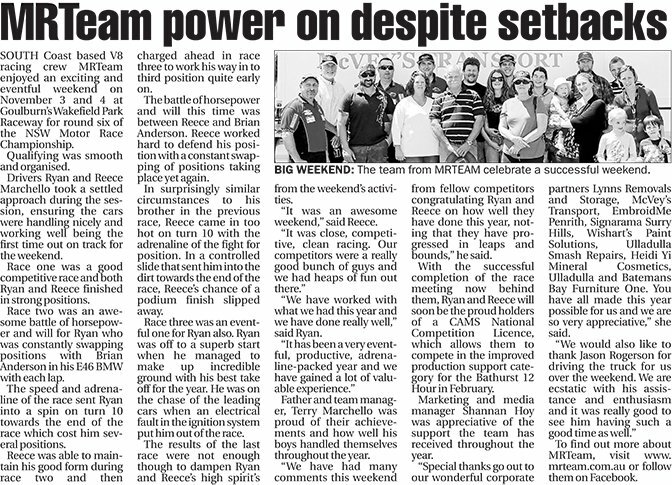 SOUTH Coast based V8 racing crew MRTeam enjoyed an exciting and eventful weekend on November 3 and 4 at Goulburn’s Wakefield Park Raceway for round six of the NSW Motor Race Championship. Qualifying was smooth and organised. Drivers Ryan and Reece Marchello took a settled approach during the session, ensuring the cars were handling nicely and working well being the first time out on track for the weekend. Race one was a good competitive race and both Ryan and Reece finished in strong positions. Race two was an awesome battle of horsepower and will for Ryan who was constantly swapping positions with Brian Anderson in his E46 BMW with each lap. The speed and adrenaline of the race sent Ryan into a spin on turn 10 towards the end of the race which cost him several positions. Reece was able to maintain his good form during race two and then charged ahead in race three to work his way in to third position quite early on. The battle of horsepower and will this time was between Reece and Brian Anderson. Reece worked hard to defend his position with a constant swapping of positions taking place yet again. In surprisingly similar circumstances to his brother in the previous race, Reece came in too hot on turn 10 with the adrenaline of the fight for position. In a controlled slide that sent him into the dirt towards the end of the race, Reece’s chance of a podium finish slipped away. Race three was an eventful one for Ryan also. Ryan was off to a superb start when he managed to make up incredible ground with his best take off for the year. He was on the chase of the leading cars when an electrical fault in the ignition system put him out of the race. The results of the last race were not enough though to dampen Ryan and Reece’s high spirit’s from the weekend’s activities. “It was an awesome weekend,” said Reece. “We have worked with what we had this year and we have done really well,” said Ryan. Father and team manager, Terry Marchello was proud of their achievements and how well his boys handled themselves throughout the year. “We have had many comments this weekend from fellow competitors congratulating Ryan and Reece on how well they have done this year, noting that they have progressed in leaps and bounds,” he said. With the successful completion of the race meeting now behind them, Ryan and Reece will soon be the proud holders of a CAMS National Competition Licence, which allows them to compete in the improved production support category for the Bathurst 12 Hour in February. Marketing and media manager Shannan Hoy was appreciative of the support the team has received throughout the year. “Special thanks go out to our wonderful corporate partners Lynns Removals and Storage, McVey’s Transport, EmbroidMe Penrith, Signarama Surry Hills, Wishart’s Paint Solutions, Ulladulla Smash Repairs, Heidi Yi Mineral Cosmetics, Ulladulla and Batemans Bay Furniture One. You have all made this year possible for us and we are so very appreciative,” she said. To find out more about MRTeam, visit www. mrteam.com.au or follow them on Facebook.